Facebook has quietly launched a new talktime offer to lure new registrations via mobile phones by offering talktime worth Rs 50 for free in return. 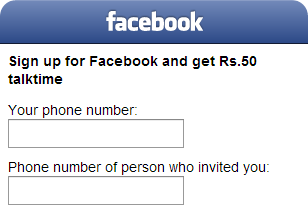 So if a user registers himself/herself to Facebook through mobile using the URL m.facebook.com/tt, his mobile number would get credited by Rs 50. Obviously, this offer is meant for new registrations only and is valid for registrations through mobile only. It's only available In India only. 2. Now enter your new mobile number and your alternate number, you can also add your friends number as referred one. 3. Make sure that the number you enter is new and genuine as you will get a verification message on it, now press Next and enter some more basic details that will create your free account on facebook. 4. Now when your account is created and validated just wait for 3 days to get your free Rs.50 recharge. Facebook reserves the right to discontinue this service at any time without notice. Talktime rewards earned before this service is discontinued will be credited as appropriate.